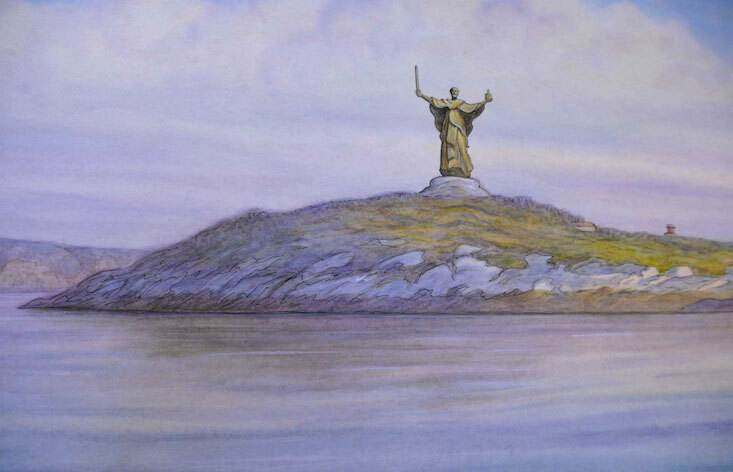 Officials in northern Russia are paying out to build a giant religious statue on a tiny island in the icy waters of the Arctic Ocean. A monument to St Nicholas, the patron saint of sailors, will be erected on Salniy Island, just a few kilometres from the headquarters of Russia’s Northern Fleet in Severomorsk. The head of the Russian Orthodox Church, Patriarch Kirill, approved the plans — which show a colossal statue of Nicholas wielding a sword — in a special meeting earlier this week. Fleet Commander Nikolay Yevmenov said that the statue would be seen by all ships sailing into Severomorsk and the port city of Murmansk. “Throughout the polar days and the darkness of the polar nights, the monument will show the way both to sea and to home,” he said. The announcement comes just days before the opening of a new two-metre statue to St. Nicholas in Murmansk itself. The remote city already has one epic landmark, dedicated to the soldiers who defended Russia during the Second World War. The 36-metre statue, depicting a man affectionately known as Alyosha, looks out over the bay and towards the Valley of Glory, where the fiercest fighting of the Arctic Campaign took place in July 1941.